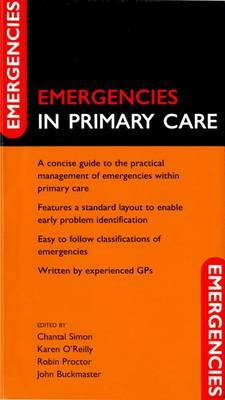 Designed for the busy GP, Emergencies in Primary Care covers the range of emergencies GPs might expect to encounter in the primary care setting, from the immediately life-threatening to the smaller but urgent problems that can and do arise. Written in a concise and didactic style, it incorporates useful algorithms to make complex management straightforward. Government guidelines are incorporated along with links to further information sources. Each clinical topic is succinctly addressed with all the information needed to make an accurate diagnosis, other diagnoses to consider and a clear management strategy.